In case you can't tell from my blog design, my favorite colors are pink and green. In addition to using them in my blog design, they were my wedding colors, and also the colors of Caroline's nursery. So pretty much from the moment I saw this dessert in June's Bon Appetit, I knew I needed to make it. Not to mention that I am absolutely loving pistachio flavored desserts these days, and strawberries are at their peak. So I knew this would be something I'd love. As expected, this turned out to be such a pretty dessert. 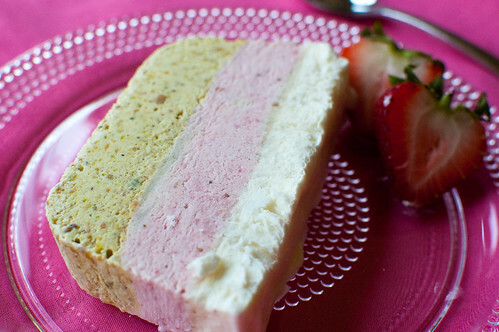 As I mentioned, the pistachio layer was my favorite, but the strawberry and vanilla layers were great as well. This would be a great dessert for entertaining, since it is made completely ahead of time, and it presents so beautifully. I think it would also be great served with strawberry sauce or chocolate sauce, but it was still wonderful on it's own. Line a loaf pan (approximately 9x5x3") with 2 layers of plastic wrap, leaving a generous overhang on all sides. Grind pistachios and 2 tablespoons sugar in a food processor until very finely chopped. Transfer pistachio mixture to a small saucepan. Add 1/2 cup milk and bring to a boil. Remove from heat, cover, and let steep for 20 minutes. Set a fine-mesh strainer over a medium bowl; strain, by pressing down on the pistachios with a wooden spoon or spatula. Discard the solids. Stir in almond extract and set pistachio mixture aside. Place remaining 1/2 cup milk in a medium bowl. Stir in the vanilla extract and chill until ready to use. Purée strawberries and 2 tablespoons sugar in a food processor until smooth. Set a fine-mesh strainer over another medium bowl; strain, pressing on solids to extract as much juice as possible. Discard solids. Stir in vanilla extract and set strawberry mixture aside. Whisk eggs, salt, and remaining 1/2 cup sugar in a medium metal bowl. Set bowl over a medium saucepan of simmering water (do not allow bottom of bowl to touch water). Beat egg mixture at high speed until it triples in volume and an instant-read thermometer inserted into mixture registers 170°F, about 3 minutes. Remove bowl from heat and continue beating until thick and cool, about 3 minutes. Add one-third of egg mixture to each of the pistachio, strawberry, and vanilla mixtures; fold each just to blend. Beat cream in a large bowl until soft peaks form. Add one-third of cream to each of the pistachio, strawberry, and vanilla mixtures; fold each just to blend. Cover vanilla and strawberry mixtures separately; chill. Pour pistachio mixture into pan; smooth top. Cover; freeze until firm, about 45 minutes. Gently pour strawberry mixture over pistachio layer; smooth top. Freeze until firm, about 45 minutes. Gently fold vanilla mixture to blend; pour over and smooth top. Freeze until firm, about 4 hours. DO AHEAD: Can be made 3 days ahead. Fold plastic wrap over; seal tightly and keep frozen. To serve, uncover semifreddo. Using plastic wrap as an aid, lift from mold. Invert onto a chilled platter; peel off plastic. Slice crosswise. This looks and sounds amazing! I can't wait to try it. This looks like an awesome summer recipe!!! this looks awesome. I love the colour combination. thank you for posting this! I marked this as a recipe to try but was intimidated by the amount of steps and how complicated it seemed. I'll definitely give it a shot now (as you say it's not as hard as it appeared). Sometimes the best treats are a labor of love and I'm always amazed the recipes I make that are time consuming tend to be the ones I like best! Mmm so tasty looking. Especially the pistachio part! Wowzers. This is amazing. Also? Pink and green are a great combo! 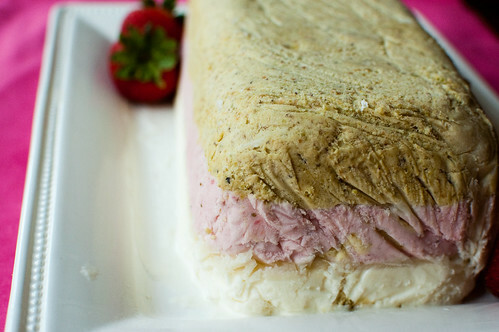 This reminds me of spumoni ice cream, which I love,...minus the chocolate and plus vanilla. Sounds delicious! Gorgeous! What a fun summer dessert or a treat for a girls party! I haven't updated it as the last post was about a 1 1/2 months from my due date and now we have a 6 week old that keeps up pretty occupied! Janell, sure go ahead! Congrats on your new addition!